Photographs are crucial to the structure and historical reception of this book, but an argument can be made that they are relatively neglected. They serve simple functions, principally either to document places, objects, events, and people mentioned in the text, or to provide what Breton called “anti-literary” mystery. 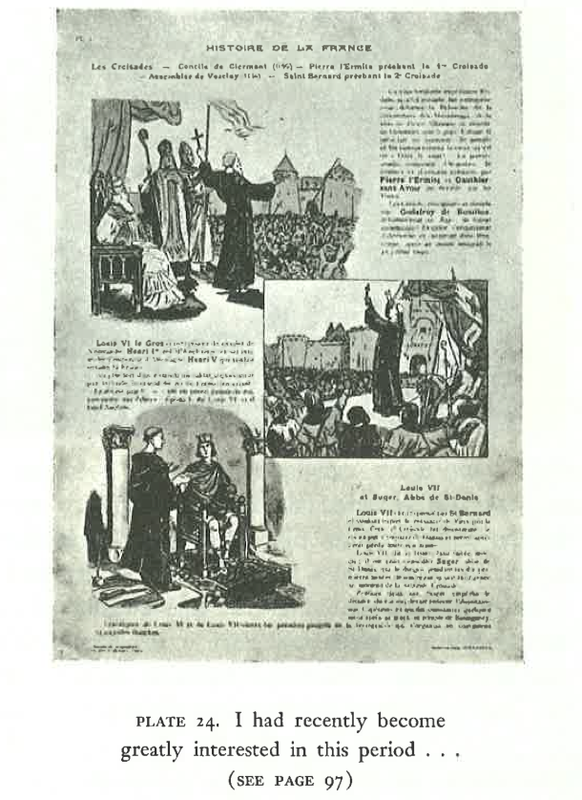 There is internal evidence of different sorts that Breton spent only a small amount of time thinking about his illustrations, despite the fact that he revisited the text for the 1963 edition and changed some photographs. I will pursue that argument in several parts. What follows is based on the 1960 English translation, and checked against the 1964 Gallimard paperback. The book was published in 1928, re-issued in a definitive edition in 1945, altered (“entièrement revue par l’auteur”) in 1963, and translated in 1960. I have not had a chance to look at the 1928, 1945, or 1963 versions, so I have avoided claims that might depend on the exact placement of images, although I assume the 1964 paperback is not significantly different in arrangement from the 1963 revision. Breton changed a few photographs for the 1963 edition; the English translation reflects the 1928 original. I have added some comments about that toward the end. Some scans here are from the English translation, and some from the 1964 Gallimard edition. Breton says “I am concerned, I say, with facts which may belong to pure observation, but which on each occasion present all the appearances of a signal, without our being able to say precisely which signal, and of what” (“présentent chaque fois toutes les apparances d’un signal, sans qu’on puisse dire au juste de quel signal,” Gallimard edition p. 20, Howard translation p. 19). When it comes to interpreting the illustrations, that remark asks to be read in two ways, one attending to the expression “pure observation,” and the other to the idea of a signal. The figure of “pure observation” suggests that illustrations will be “facts,” simply seen, recording places described in the text; as it turns out that means that the illustrations are themselves simply observed, meaning seen in a cursory way, not really pondered. Most of Breton’s photographs are indifferently lit, composed, and framed; some contain people, and some don’t; some show only the shop or café or person described in the text, and others show much more; some bear traces of the time of day or season, others don’t. The second figure, of the “signal,” suggests that the photographs should also be taken as reminders or indicators of objects, people, and places that are significant but insufficiently explained, interpreted, or contextualized. In the introduction to the 1963 edition Breton says that he intended his photographs to have an “anti-literary” purpose, meaning that he wanted them “d’éliminer toute description.” This is unevenly true of the photographs in the book, because the lack of extended explanation or ekphrasis makes the photographs mysterious; but it is also effectively true of the content and structure of each individual photograph, because it appears Breton did not look closely enough at his photographs to notice the many possibilities for “signals” in their details or compositions. 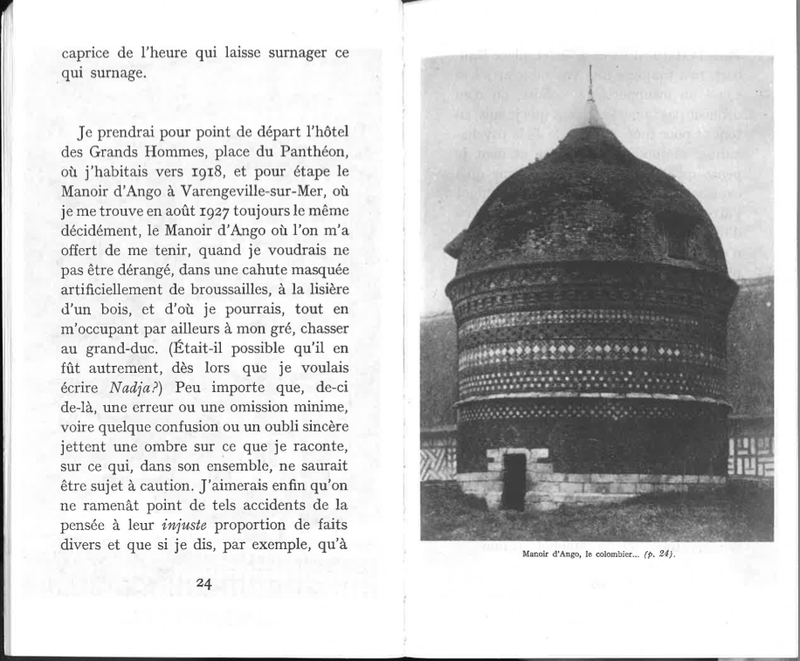 Toward the end of Nadja, speaking of the book’s composition, he says he went back “to look at several of the places” he had mentioned in the narrative, in order “to provide a photographic image of them taken at the special angle from which I myself had looked at them” (pp. 151-2). 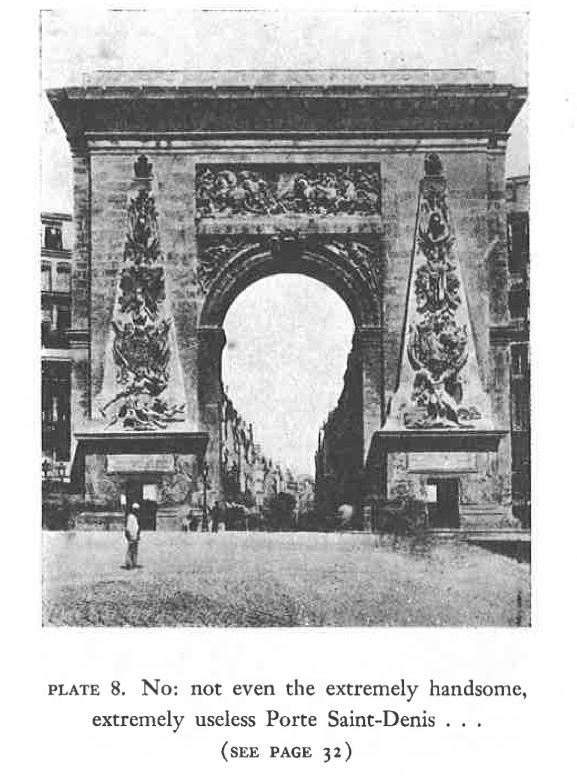 This is the first a reader hears about the photographs; in the rest of the book the captions tell readers what passage they illustrate, and nothing in the book refers to the illustrations as photographs rather than as direct representations of places. It is also the only time Breton mentions anything to do with the framing of his photographs. I don’t think it is possible in most cases to guess what the “special angle” might be, and so I doubt the veracity of his comment; it seems more likely that he told Jacques-André Boiffard (the photographer who took the street scenes for Breton) the locations he wanted photographed, but not the angles, or at least not with any precision. Breton also says, in the same passage, that “the illustrated part of Nadja is quite inadequate,” but his idea of inadequacy is mainly the fact that some images he wanted are missing. (He describes one particular missing image in some detail on p. 152.) “Inadequacy” isn’t related to the interest or properties of the existing photographs. For me all of these things are signs of the kind of attention Breton paid to his photographs: it was cursory, and it seldom had to do with the detailed contents of the images: it’s not so much that he “excluded all description” of the photographs, as that he did not pause over things that could have been described. 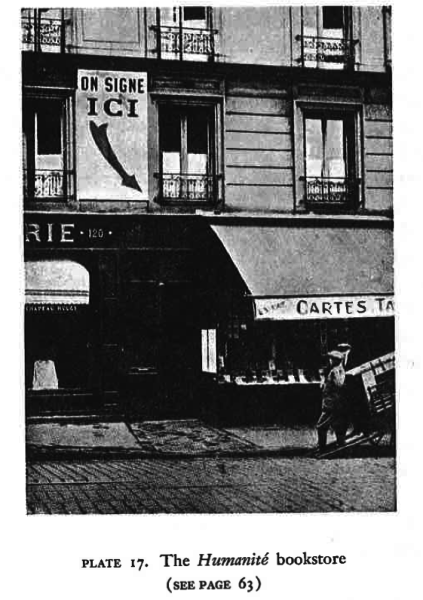 “The Humanité bookstore” also has a wonderful sign, “ON SIGNE ICI”; it shows a person leaning against a cart; windows giving onto dark rooms half-covered with curtains; and a shop (possibly something like “CARTES TABAC PRESSE”): in other words, many things to see, things that could be echoed in the text, but aren’t. There are a few wholly unexplained images in the book—not enough, however, to constitute a strategy or an aesthetic, as they do in l’Amour fou. 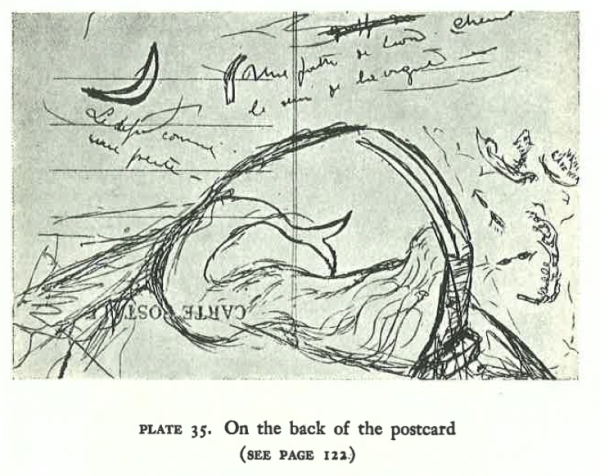 There is a manuscript page tied to the text “Speaking of the Théâtre Moderne” (p. 43); a Surrealist artwork inexplicably standing in for something “perverse” that might be found at a flea market (p. 54); and just two photographs that are not referred to in the text—both drawings of Nadja’s (pp. 123, 126). A couple of these unexplained images seem to be tentative experiments that were never carried through. (Are we supposed to think the MS on p. 43 is part of the MS of Nadja?) The drawings presented as being by Nadja herself seem to have been added with the intention of providing descriptions. These are exceptions that prove the rule, which is that photographs provide straightforward documentation of the narrator’s own experience. Documentation, however, has a special valence in this book and in Surrealism more generally. In this case a document also needs to be understood as a mystery, and specifically a “signal,” an “antilittéraire” gesture, a mystery that might not be solved. Another concept articulating Breton’s Surrealism in this book is the enigma, the inexplicable event or object, because its “convulsive beauty,” its “shock” (“saccade,” p. 189 in the Gallimard edition, p. 160 in the English translation), reveals the world’s randomness and mystery in such a way that it prevents “work,” planning, orderly living, and the other trappings of the bourgeois life (p. 59). 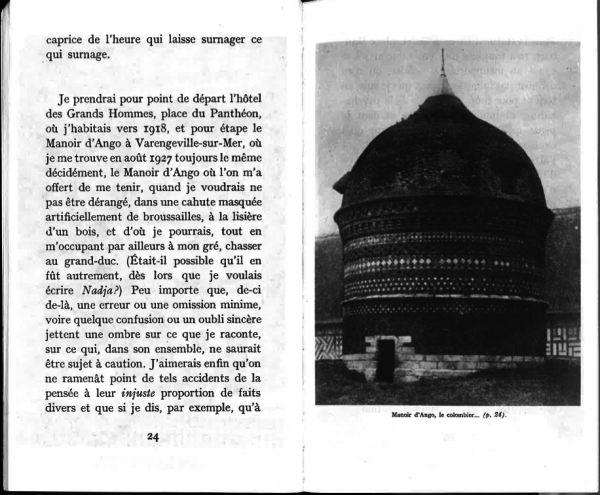 So it makes sense that most of the places Breton photographs have meaning more for him than for readers; but in some cases the places don’t even have clear meaning for Breton, and in that case they are displayed as “documents”—evidence of an absence of meaning, or of potential meaning that the narrator might consult in the future. The detail of the Uccello painting is an example, because it isn’t the entire painting, which in any case he says he can’t understand (p. 95). 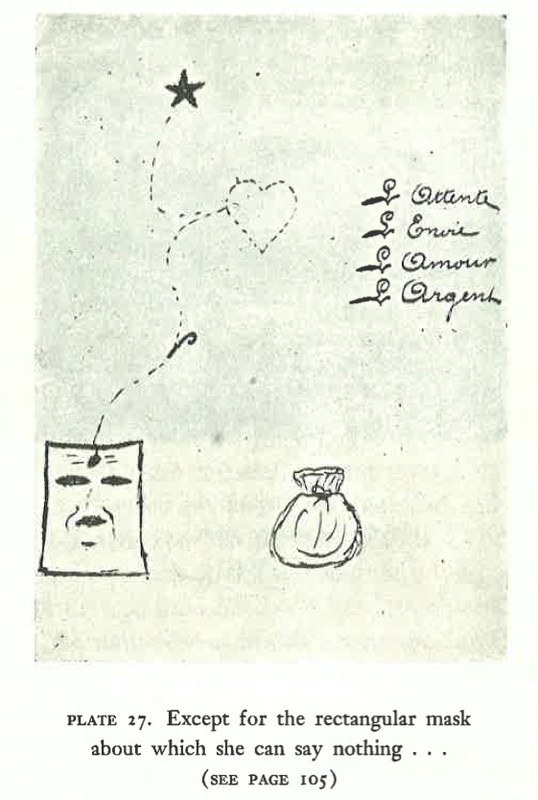 These are two kinds of “signal” or enigma: produced enigma, which supports the Surrealist philosophy, and documented enigma, which supports Breton’s desire not to understand. The two work in different directions. When he takes pleasure in the bronze cast of a glove (p. 57) or substitutes a Surrealist artwork for something bought in a flea market (p. 54), he is producing enigma. When he reproduces part of a painting he does not understand (p. 95), he is working privately, documenting the inexplicable, adding to his store of enigmatic objects, events, and places. The places Nadja and he met, which account for most of the photographs in the book, are examples of both, but they can only work in the book as produced enigma. Jacques-André Boiffard’s photographs of cafés and other establishments are unremarkable, except in that their ordinary nature they contrast against the mysterious, intense, and enigmatic encounters with Nadja. Breton does not seem to have been interested in interesting photographs. When it was possible, he used commercially available portrait photographs (for example of the medium called “Madame Sacco,” p. 81). A friend named Henri Manuel took the pictures of Breton, Professor Claude, and Blanche Derval (pp. 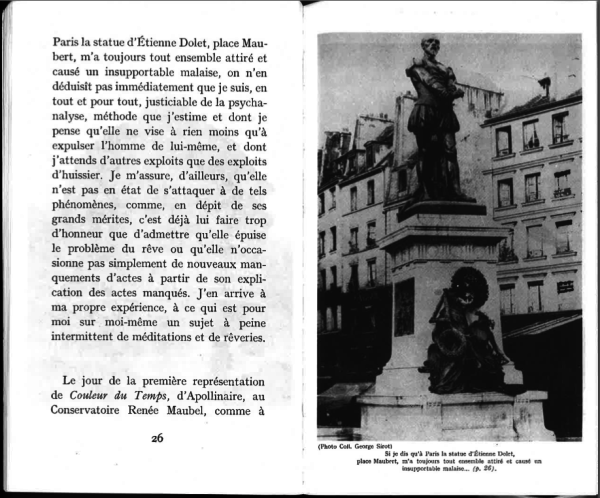 47, 137) and the interior of the theater (p. 44); Man Ray provided the photographs of Benjamin Péret (p. 30) and the book’s only interesting portrait photograph, of Robert Desnos (p. 33). 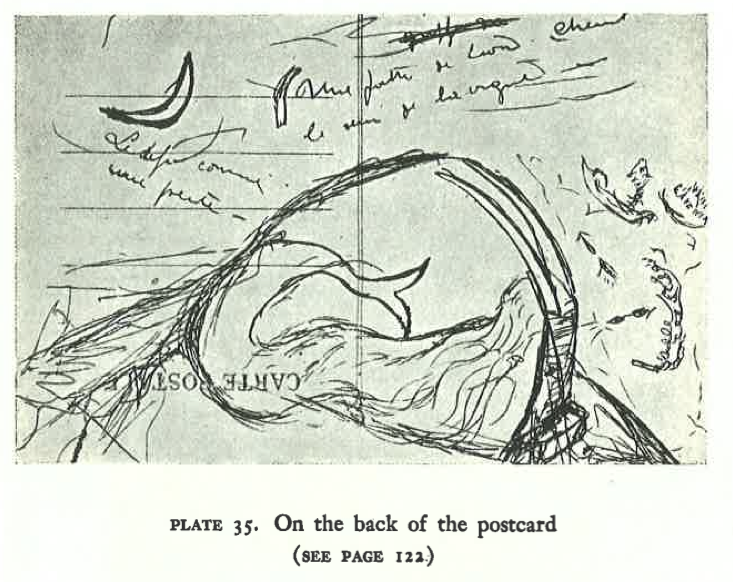 Breton probably had Boiffard, Manuel, or Man Ray take the photos of Nadja’s drawings, of documents (for example pp. 35-36), the colored print of Louis VII (p. 96), and the reproduction of the Uccello painting (p. 95). I can imagine him bringing all those materials in a sheaf to their studios. 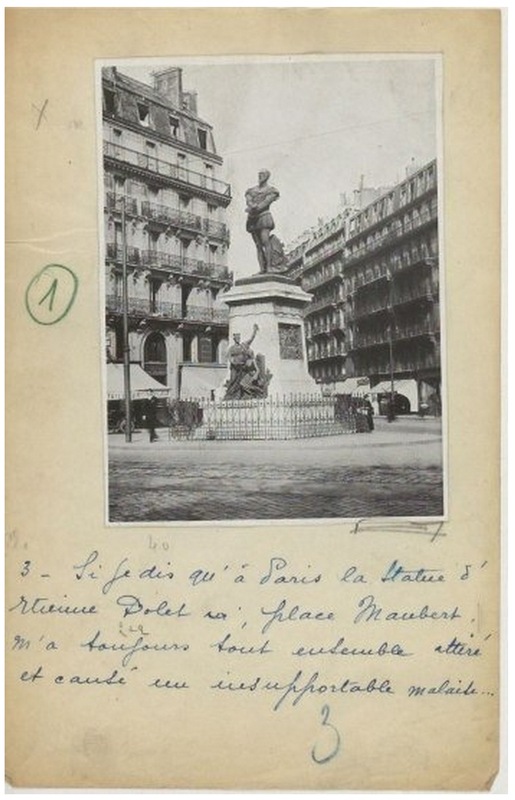 From details like these it is possible to reconstruct the process by which Breton assembled his book: he asked Boiffard for the street scenes, and Manuel and Man Ray for some portrait photographs; others he got from commercial agencies; he got photographs of artworks from museums (see the complaint on p. 152 about the Musée Grevin). Collecting images was probably a fairly easy, haphazard enterprise, and it probably didn’t take him much time. Omissions bothered him a little (p. 152), but not too much. This paints a very different picture from the photographs collected, for example, by Sebald, or other authors more engaged with the visual. What counts as something worth photographing? To the extent that it is rewarding to ask what Breton thought was photographable—what could, or should be photographed—it is interesting to consider things that are not photographed in the book. He may have wanted to photograph the poster of the “red hand” “a little beyond the Borbon bookstore,” but if he did he doesn’t say so (p. 100). The poster may have been taken down by the time he came around with his camera. He may have wanted a picture of the “tiny card” he says Nadja gave him, which he later passed on to Paul Eluard, but he doesn’t say (p 102). There are other omissions that are difficult to understand: no photographs of the images in poems (pp. 72-73), no photographs of a person who could represent Nadja, no “street photography” of people, weather, or incidents he mentions. It is hard to understand the rationale for some of these omissions, and I think that’s because Breton did not develop a consistent acknowledgment of the meaning of visual objects in his book. I assume it’s the exigencies of publishing in 1928 with Gallimard that led Breton to arrange the images as he did. They are always within five pages or so of the pertinent passage in the text, although some are ahead of the relevant passage and some behind. I assume that ideally, he would have preferred all images to be more tightly or conveniently paired with their corresponding texts. By assuming this, I’m claiming that the pairing of images and text was largely a matter of indifference to him: images a couple of pages from their call-outs was common practice at the time (because of the necessities of binding in signatures and sewing in plate pages), and had no special meaning. He either didn’t care to change that, or couldn’t afford to. The pages on Nadja’s drawings, pp. 121, 122, and 129, are more problematic in this regard. Each one of those three pages has four passages corresponding to four images. It’s reasonable to assume he could have had 12 images on 12 successive pages, with running captions underneath. I don’t know if there’s any evidence he thought of that, but it would be good to know, because it would decisively change the way the entire book reads. Images, at that point, would suddenly take over, and text would be subordinate. That happens, many years later, in Bataille’s Tears of Eros, but perhaps it could have happened in Nadja as well. 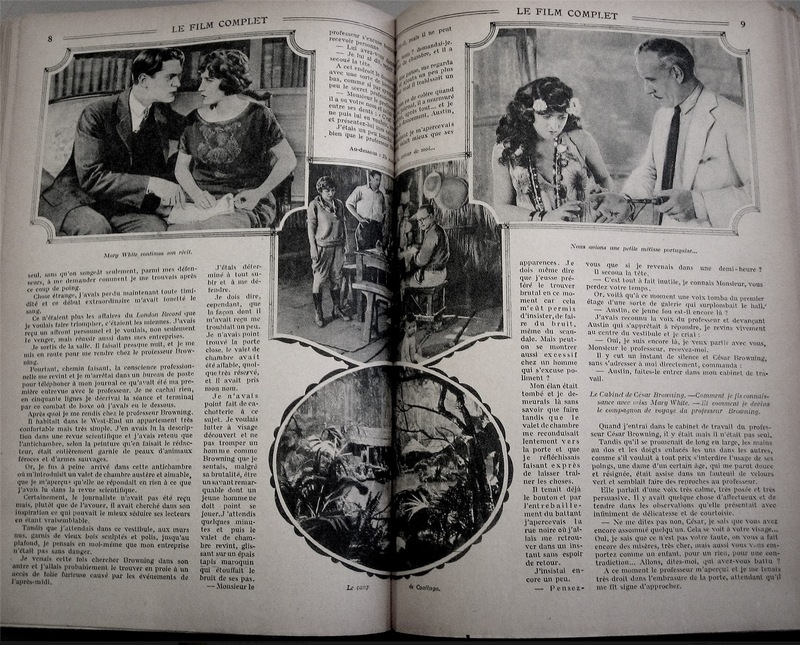 The Livre de poche edition has smaller pages, while all of the images are bigger, making for a much more satisfactory balance of picture against text area. The images are also darker, with correctly printed mid tones, and punchier in detail. More complete picture credits, although there are still omissions, enhance the pocket version. Gallimard’s later Folio edition should be avoided, though — the faded images are worse than Penguin’s. This is the kind of visual deterioration that W.G. Sebald used strategically to complicate the reader’s response to the veracity of the images interspersed in his narratives, but Nadja works differently. Boiffard’s famously deadpan, depopulated and far from picturesque pictures of the Saint-Ouen flea market, the Humanité bookstore and the Sphinx Hotel gain in mystery the more solid and definite they become… Breton wanted a “medical” style of dispassionate observation in the images, as well as the writing, and Boiffard, like Breton, had been a medical student. “Perhaps life needs to be deciphered like a cryptogram,” writes Breton. The differences are illuminating for the kind of attention he paid to photographs and the meanings he hoped they could convey. A study by Konrad Rupp, “Die Rolle der Illustrationen in Bretons ‘Nadja'” (Grin Verlag, 2010) is helpful here. Rupp notes that the book’s opening photo, of the Hôtel des Grandes Hommes, includes the statue of Rousseau, who is mentioned later in the text. 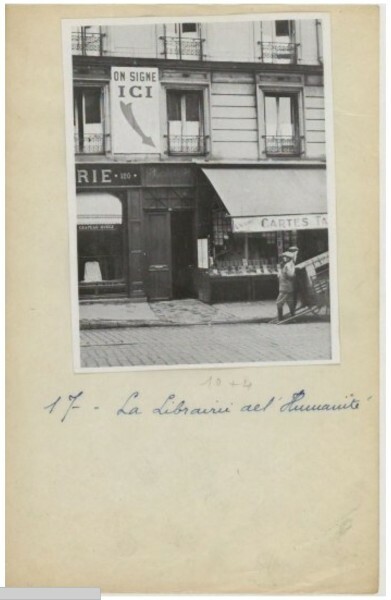 It is possible that a reader who knew Paris, and recognized Rousseau, would think back to the photograph when she came across the later mention; but in general I think Rupp’s readings overstate both Breton’s investment and a plausible reader’s engagement. 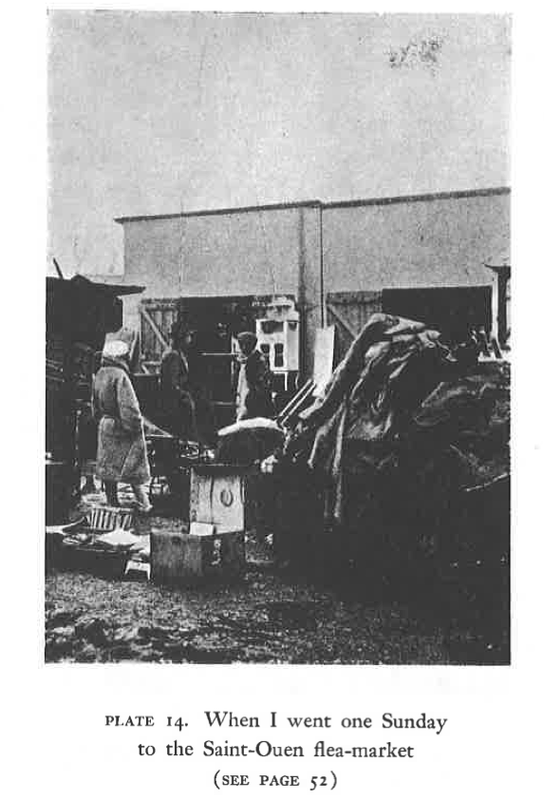 Rupp also says that the coal cart parked in front of the hotel is a proleptic allusion to the book’s fifth photograph, which is captioned “The words BOIS-CHARBONS.” It seems more likely that Nadja is not structured by small-scale allusions like these, given the evidence that Breton was more aware of his photographs’ gestalt than their details. The passage on the Manoir is immediately followed by a mention of the statue of Etienne Dolet in the Place Maubert, which “has always fascinated me and induced unbearable discomfort (“un insupportable malaise”). For Rupp it matters that this is the second statue in just three photographs—for a reader encountering the book for the first, time the three might well go together because the Manoir d’Ango also has the character of “an antique tomb.” It also fits Breton’s description that Dolet, who was a controversial polemicist and murderer, was strangled and burned in the Place Maubert. But I doubt Breton noticed that in the background there is a shop with the sign “tailleur [de pierre? ],” a stone cutter’s or stone mason’s shop—and if he did notice, I don’t think he would have thought that the people commemorated by the statues, as well as the statues themselves, are “imprisoned” (“eingesperrt”), or that a stone mason is an “allegory” for gravestones. All that is possible, but there is no consistent evidence Breton thought of his photographs that way: no trail of clues, no evidence of punning or allegories of objects in the photographs, and plenty of evidence that the pictures were taken without special regard for framing. 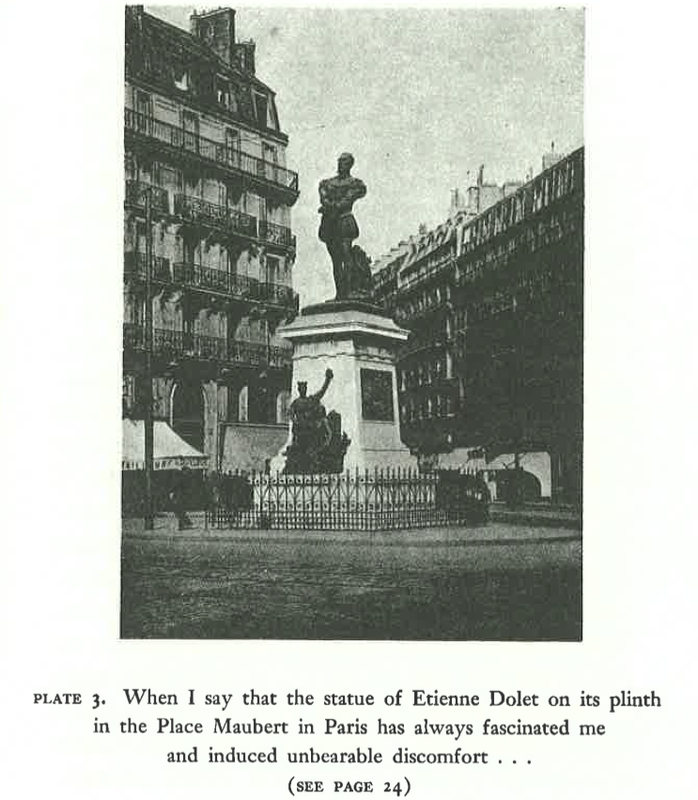 In the 1963 edition Breton chose a close-up view of the statue, which I would think is evidence against Rupp’s kind of reading. Nevertheless he reads the word “Maison” on a sign in the background. This kind of myopic iconographic reading is not warranted by the images, but neither is a generalized reading of “angoisse.” I think a more responsive reading is one that neither collapses the photographs to individual allusions, or enfolds them in a general affect. 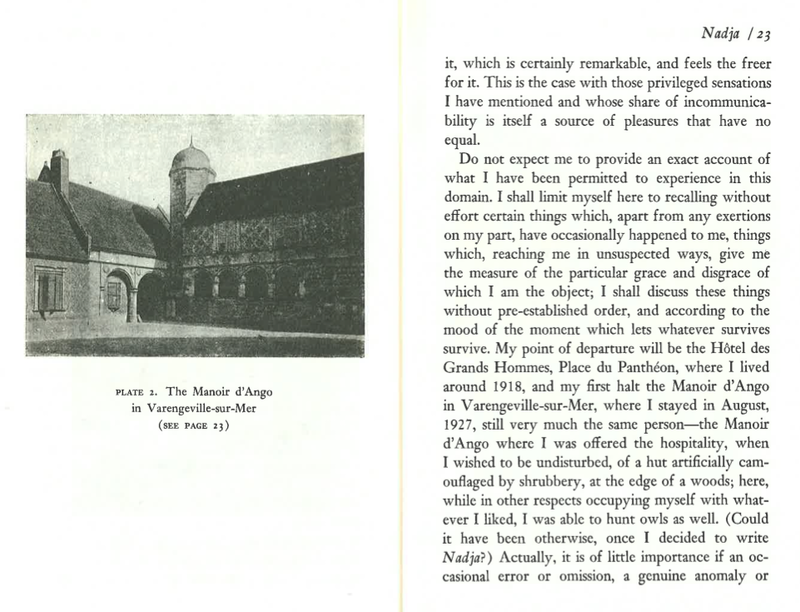 Reading a draft of these comments, Gregory Ulmer said that “Nadja anticipates and influences psychogeography (and hence choragraphy also), and is an important contribution to the whole Everyday Life orientation, which includes Benjamin among others.” Hence, Ulmer wrote, “the indifference to aesthetic quality” in the photographs “is deliberate, and associated with pop, quotidian authenticity (also an aesthetic effect).” Ulmer’s is a more sympathetic reading of the aesthetic “indifference” of Nadja’s photographs. For me, this raises an interesting problem: the narrative isn’t indifferent to details such as particular turns of phrase, nuances of expression, and the verbal compositions of the vignettes involving Nadja; but the street photographs are. This quality of “aesthetic indifference” doesn’t pertain to the photographs of documents or drawings (they are full of legible and meaningful details, and some have carefully chosen compositions or interesting assemblages of objects); and it doesn’t apply to the portraits (which are carefully done according to various portrait conventions of the time). The indifference applies mainly to the street photographs. Can we distinguish between Breton’s intentions and capacities as a photographer and our proclivity to read the photographs as aesthetically indifferent? I wonder this especially in light of his own reference to the photographs as capturing the “special angle” from which he experienced each place. For Aruna d’Souza (who also read an earlier version of this text) there is a “contradiction between the prose and the generic nature of the image”: the question would be how to think of that contrast in regard to the street scenes. The text’s enormous influence has been partly due to what has been perceived as the anonymous, often deserted streets and the love story they propose to illustrate. (In that respect Nadja exactly follows Bruges-la-morte.) That contrast or “contradiction” has also been taken as a signal effect of Surrealism (it is exemplified, in Nadja itself, by the de Chirico painting). But I incline to a different reading: thinking only of Nadja, and not its predecessors or its later influence, and considering only what the text itself proposes, I think it’s necessary to conclude that Breton was not thinking of the street scenes as “generic” or aesthetically “indifferent”: I think he was hoping they would work as poignant “documents” of his “haunting,” “enigmatic” affair; but I think he just did not look at them closely enough to realize they also work very differently. 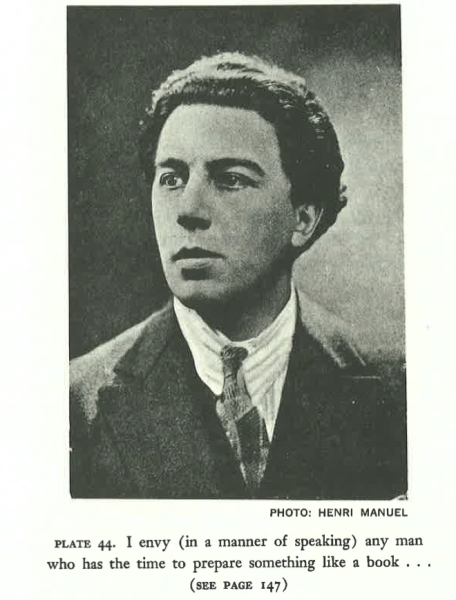 Any account of the images in Nadja needs to consider the fact that the book ends with a section that has only one photograph (an unusual paucity given the text is 13 pages long): a picture of the author. This last section is about Breton’s (the narrator’s) sense of what the book has done, why it needed to be written, and how it was assembled. It is the speculative counterpoint to the book’s longer opening section, which is a collage treatise on his theories of randomness, capitalism, and meaning. (The largest, middle section of the book is the story of Nadja.) So it’s appropriate that Breton’s portrait is the only image in this closing section, but it produces an odd effect. I think Breton meant it more or less like this: he was the author of his life, and his book was an experimental document of part of that life that impinged on some of his central concerns about reason, love, and “any action… which can be premeditated.” (p. 59) His portrait in the photograph would then be a “document,” like the buildings and other people’s portraits, of a life lead in pursuit of immediacy, “convulsive beauty,” and the pleasure of the random. For me the most telling sign of the lack of visual awareness in this book is that only two images in the entire of Nadja are described in any detail. They are both Nadja’s drawings, and even though the narrator identifies some elements in each, and even though both drawings have tremendous importance for the narrative, the ekphrasis in both cases is incomplete (pp. 108, 124). In two or three other places in the text, there are brief mentions of objects visible in images, but they are trivial and ineffectual in relation to the tremendous amount of information and expressive material in the images. Reading a draft of this text, Andrei Molotiu said I might be “expecting too instrumental a connection between words and images.” For Molotiu, “the relationship between image and text… is more connotative, more like poetry.” He suggested I look for something less “formal,” more affective or general. My sense is that it’s possible to ask about relationships between images and narrative in some detail, without being “mechanical” (as he suggested) or hoping for some single strategy or fixed relationship. In my reading, if the text asks us to attend to subtle choices of verbal images and suggestive, “enigmatic” encounters, and if the text remains nearly silent about the images except to say that they are “inadequate” attempts to capture something special about how the narrator experienced the scenes he conjures, then as readers we are obligated to think at least as carefully about the images and how they work with the text. This doesn’t preclude more general, even holistic, effects of mood or poetic association. I don’t mean to imply that Breton needed to make ekphrastic surveys of his photographs in order to show that he was aware of their visual qualities. The prose could have demonstrated that in other ways—with glancing allusions, for example, as in Sebald. Or the photographs themselves could have set up resonance with things mentioned in the narrative in other contexts (other than the passages illustrated by the photographs). And—the most interesting possibility, and the largest lack—the photographs could have more resonances and echoes of each other. For me this is a deeply non-visual book: in its author’s imagination, photographs of places, artwork, and people are documents in the simple sense—they provide evidence. They are to be glanced at, not lingered over, not seen in detail, not inhabited in the imagination. The only kind of visual material Breton studies is iconographically dense, or full of writing. He analyzes a few of Nadja’s symbolic drawings, which are as dense in symbols as Jung’s patients’ drawings. He reads broadsheets and posters (pp. 35, 36, 96). But when it comes to photographs, he barely looks. Nachergael thinks the principal influence on Breton at this point was the “fin-de-siècle popular press and the cine-novels… sold on the grand boulevards for a couple of cents.” It’s important to bear this in mind, too, when the subject is the eerily deserted street scenes: Breton may have largely invented them himself. This is the place to note that there are readings of Nadja that stress the uncanny, mysterious nature of the images, and contrast those qualities with the often specific narrative. The difference is said to produce a deep sense of mystery. Because Breton gives inconclusive signs and signals about how he wants images to interact with the narrative, some readers have preferred to read silent mystery in the abandoned streets, and personal narrative in the prose. That contrast has been taken to be crucial to Surrealism. The critical reception of Nadja focuses on the unreliability of the narrator, the fictitious construction of Nadja, and the possibility that Nadja is all of Paris. I think, based on the claims made in the text—how it represents itself—that Breton would have been surprised by that. I think he also would have been surprised to read that the images are generic, and that the contrast between their faceless anonymity and the story of Nadja creates the Surrealist effect. That is, to put it directly, not what the text claims. 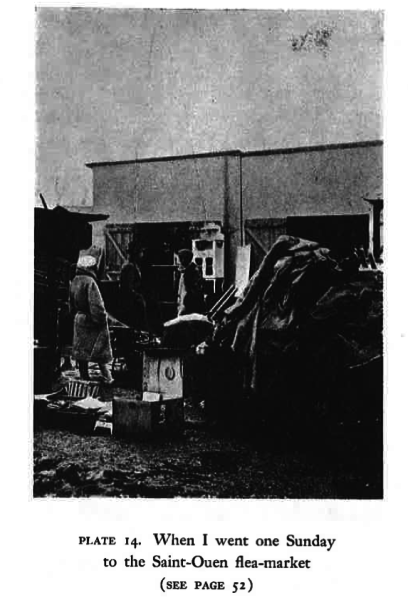 Authors who have tried to illustrate their novels with photographs have often found that the photographs have to be of deserted scenes, often seen from a distance: otherwise the photographs interfere with the reader’s sense of the characters and places. Breton only laments he did not have more photographs, not that he couldn’t find more poignant scenes of deserted streets. Readings of Nadja that picture the sum of the images in the book as oddly deserted, inhuman, generic, unaesthetic, random, or uncanny miss what I take to be the author’s intention: the images are admittedly “inadequate” attempts to “document” the relationship. My sense of the general problem I’m pursuing (narrative prose with images) is that the more general, holistic, unspecifiable resonances between photographs and text can only work when the narrative and the images collude in implying that kind of relation. It happens in l’Amour fou. Here, I think, there is an unresolved, uneven level of attention to detail, which doesn’t license the more general reading.The authors who engage me the most can be held responsible for signaling the levels and kinds of attention and connections that are appropriate, and in the nearly total absence of those clues, I begin by pursuing whatever close readings are available, even if they lead to “inappropriately” critical conclusions. Thanks so much for this fascinating post! 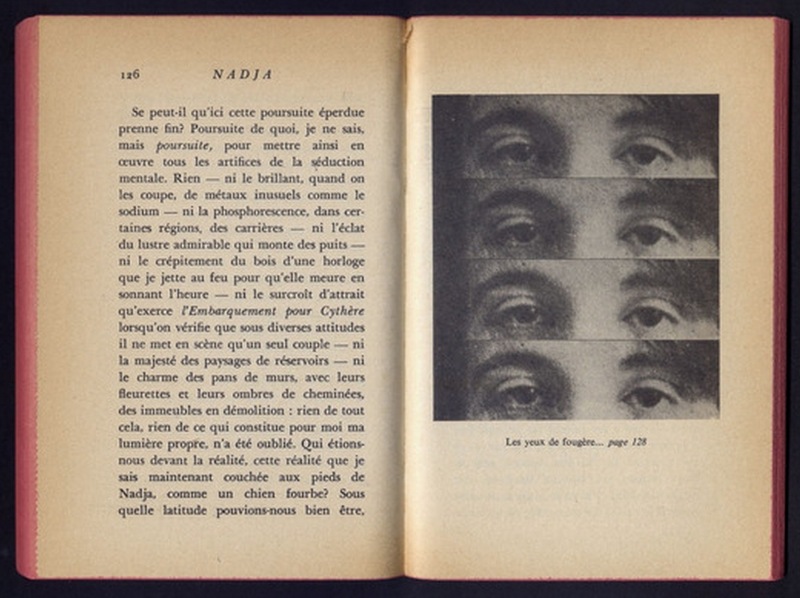 Every time I teach Nadja, it’s in a course where some students are reading the text in English (the standard translation uses the photos from the original edition) and others are reading it in French (using the Poche edition with the later selection of photos). Inevitably, a huge discussion breaks out when the students begin to compare the photographs in the two editions. Your blog gives the first sensible explanation for the difference that I’ve read anywhere. I’m teaching Nadj again this coming Fall (2016), and now for the first time I’ll have something to refers students to (I’m putting the URL to your comments up on my course website). A thousand thanks!